Depending on the fuel you are using, the Kelly Kettle ® will boil water in 3 to 5 minutes. Made from Aluminium or Stainless Steel, it is essentially a double-walled chimney with the water contained in the chimney wall. 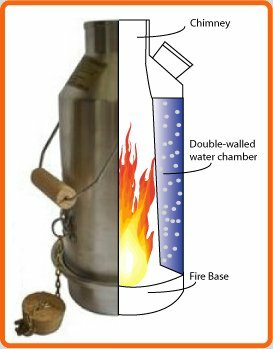 Once the campkettle is filled with water, simply start a very small fire in the base, set the kettle on the base and drop additional fuel (twigs, leaves, grass, paper, etc.) down the chimney. If additional water is required, simply refill the kettle with water and place it back on the base when the fire is still burning. Refill the chimney with fuel and you can look forward to a second kettle full of boiling water within a matter of minutes. Our kettles work in even the most extreme weather conditions - in fact, they work better in wind so there is no need to find shelter when brewing up! Is this essential camping equipment? We think so! Always remove the cork/stopper before lighting the kettle. The cork/stopper is only to be used for transporting cold water. The Kettle is not designed to replace your water bottle and should be carried upright when filled with water as occasionaly, the chimney top may not always be completely watertight and could drip/leak water if the kettle is turned on its side or upside down.